Permex Petroleum Corporation Announces Farmout Agreement with Blackspear Capital Corp.
VANCOUVER, May 29, 2018 /CNW/ - Permex Petroleum Corporation (the "Company" or "Farmor" or "Permex") (CSE: OIL) announces that it has signed a farmout agreement (the "Agreement") with Blackspear Capital Corp ("Blackspear" or "Farmee") a Venture Capital firm focused on pursuing opportunities in the Resources Exploration, Cleantech and Consumer Technology Sectors. The property that Blackspear will farm-in on is the 680 acre Oxy Yates property that Permex owns in Eddy County, New Mexico. The farm-in specifically relates to the Company's leases located in Section 14, Township 20 South, Range 28 East. The target is the Yates formation of the upper Guadalupian series of the Permian system. The Yates formation is 50 – 60 feet thick and is located at an average depth of 1200 feet, as stated in the independent reserves report prepared by MKM Engineering, independent qualified reserves evaluator, effective as of September 30, 2017 (the "Reserves Report"). Management believes that the excellent 10-acre well spacing provides the opportunity for and estimated 32 locations to be drilled and completed at a management estimated cost of US$50,000 – US$80,000 per well. Management believes the Yates formation is an excellent shallow infill checkered drilling opportunity with potential waterflood secondary recovery also available on this property once primary recovery has been maximized and exhausted through drilling and development. Pursuant to the Agreement, within 30 days of Blackspear's shares being listed on the Canadian Stock Exchange, (the "Commencement Date"), Farmee will commence drilling of the initial well of a five (5) well program and Farmee shall retain the option to drill an additional Test Well every six months thereafter. The entire cost (100%) associated with the drilling and completing the operations under the Agreement are borne solely by Blackspear. Upon the Farmee earning any income from the sale of any oil, natural gas, or other hydrocarbons, the Farmor shall retain a twenty-five percent (25%) working interest before payout in the assigned leases applicable to that particular well which has received revenues from oil, gas and other hydrocarbons until such time as the Farmee has recovered its costs (after payout) at which time the Farmor shall retain a fifty percent (50%) working interest in the well. Mehran Ehsan, President and CEO of Permex Petroleum Corporation commented, "Permex Petroleum is excited to have executed the Farm-out Agreement thereby securing the relationship with Blackspear as a Venture Capital strategic partner. This partnership will enhance Permex's ability to drill and develop its assets without accessing debt or further accessing equity markets, thereby reducing the debt and market dilution risk and strengthening the Company's ability to perform its reserve development program in a timely fashion." Khaleel Meghji, President of Blackspear Capital Corp. commented, "We are delighted to have executed the Farm-out Agreement with Permex Petroleum. We believe the Oxy Yates property is a very promising oil and gas field and that Permex Petroleum's portfolio of Texas and New Mexico acreage is among the most exciting farm-in opportunities we've evaluated in the region. We look forward to working closely with Permex to define and execute the drilling opportunities as quickly and economically as possible." Permex Petroleum Corporation is a junior oil and gas company with a focus on identifying, evaluating and acquiring oil and natural gas assets in North America. Permex focuses on enhancing and developing its current portfolio of oil and natural gas assets in the state of Texas and the state of New Mexico. Blackspear Capital is focused on developing a portfolio of near term projects in high growth sectors. The company is focused leveraging emerging and next generation technologies to uncover new opportunities for growth in natural resource exploration, consumer technology, and clean energy. This press release contains forward-looking statements and information within the meaning of applicable securities laws (collectively, "forward-looking statements"), which reflect the Company's current expectations regarding future events. Statements in this press release which are not purely historical are forward-looking statements and include any statements that express or involve discussions as to expectations, beliefs, plans, objectives, assumptions or future events or performance (often, but not always, through the use of words or phrases including, but not limited to, and including grammatical tense variations of such words as: "may", "anticipates", "is expected to", "estimates", "intends", "plans", "projection", "could", "vision", "goals", "objective" and "outlook") are not historical facts and may be forward-looking and may involve estimates, assumptions and uncertainties which could cause actual results or outcomes to differ materially from those expressed in the forward-looking statements. Such forward-looking statements include, among others, the anticipated time of trading of the Common Shares on the CSE, the anticipated use of net proceeds raised under the Offering and the anticipated outstanding Common Shares and shares reserved for issuance at the time of listing. The forward-looking statements in this press release are based on a number of assumptions, including, but not limited to, assumptions regarding the stability of commodity prices, that general business, economic, capital market, legal and political conditions will not change in a materially adverse manner and that necessary governmental, securities regulatory authority or stock exchange permits or approvals will be obtained in connection with the Offering and the listing of the Common Shares on the CSE. Actual results could differ materially from those projected in any forward-looking statements due to numerous risks, uncertainties and other factors. Such factors include, among others, risks inherent in the oil and gas industry as well as the risks normally encountered in a newly established business, including but not limited to: negative cash flow; lack of adequate capital; title to property; reliance on operators; liquidity concerns and future financing requirements to sustain operations; dilution; limited history of operations and revenues and no history of earnings or dividends; competition; economic changes; and uninsured risks. This press release discloses drilling locations in the following categories: (i) proved locations; (ii) probable locations and (iii) potential drilling opportunities. 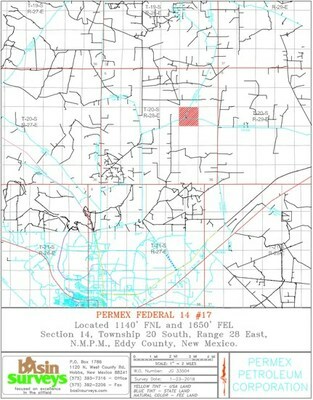 Proved locations and probable locations are derived from the Reserves Report and account for drilling locations that have associated proven and probable reserves, as applicable. Potential drilling opportunities are internal estimates based on the Company's prospective acreage and an assumption as to the number of wells that can be drilled per section based on industry practice and internal review. Potential drilling opportunities do not have attributed reserves or resources. The Company has, based on the Reserves Report and management's current internal estimate, 5 Proved Developed Producing Reserve locations, 2 Proved Non-Producing Reserve locations, 20 Proved Undeveloped Reserve locations, 7 Probable Non-Producing Reserve locations, 5 Probable Undeveloped Reserve locations. Potential drilling opportunities have specifically been identified by management as an estimation of their experience in drilling activities based on evaluation of applicable geologic, seismic, engineering, production and reserves data on prospective acreage and geologic formations. The drilling locations on which the Company or the Farmee will actually drill wells will ultimately depend upon the availability of capital, regulatory approvals, seasonal restrictions, oil and natural gas prices, costs, actual drilling results and other factors. While certain of the potential drilling opportunities have been de-risked by drilling of wells by the Company or other operators in close proximity to such potential drilling opportunities, certain other potential drilling opportunities may be farther away from existing wells where management has less information about the characteristics of the reservoir and therefore there is more uncertainty whether wells will be drilled in such locations and, if drilled, there is more uncertainty that such wells will result in additional oil and gas reserves, resources or production.